1. The novel opens with Bess’s karate teacher saying, “Pick a partner … and get a tombstone.” Metaphorically, that’s what society often urges us to do: find someone, get married, and stay married for life “until death do you part.” But how difficult is that to do in this day and age? What are our modern-day obstacles? Is such a goal realistic? 2. Bess is a thirty-something living in a city with an ache for companionship and kids, and bad luck in the dating realm. She tells Rory she feels like a cliché. How does this affect her self-image and her outlook on the future? Do you think current portrayals of single women in the media (TV, books, movies, etc.) help or hamper the happiness of real-life single women? 3. Do you think Rory should have told Bess about his ex-wives on their first date or soon after? Would you have, if you were Rory? Likewise, do you think Bess should have told him she was seeking out his ex-wives (besides Carol)? If he had told her not to, should she have abandoned her plans? 4. To what degree should our past define us? Rory argues that you don’t have to know much about someone’s past to understand that person in the present. Says Fawn on Page 413, “A man iz voser iz, nit voser iz geven” (A man is what he is, not what he has been). Bess argues, on the other hand, that we’re a sum of our experiences and that we need to understand those experiences to understand ourselves and each other. Whom do you agree with? 5. What role does storytelling play in this novel? Do the stories that Rory, Cricket, Millie, and Irv tell hide certain truths or do they help to illuminate deeper, emotional truths? If the former, what might they be trying to hide? If the latter, what would some of those deeper emotional truths be? 6. Bess feels she knows too little about her own ancestry to feel connected to a past. Why does this bother her? How does your cultural heritage – or, as for Bess, a lack of cultural heritage – contribute to your self-identity? 7. Why do you think Millie is physically harming Irv? Why do you think Irv is keeping quiet about it? 8. Bess wonders if Washington, D.C. will feel like home after her grandparents leave. And when asked if he feels homesick, Rory talks about Ireland, even though he’s been living in the U.S. for more than 25 years. What does “home” mean to each of them? What is it about where you live that makes it feel like “home”? 9. Bess is sometimes frustrated with how many secrets Millie, Irv, Cricket, and Rory keep from her. Do you think it’s wrong for loved ones to keep secrets from each other? If not, which secrets does a person have a right to keep hidden and which ones should be aired? Conversely, when does someone have the right to expose someone else’s secrets? Do you think this is going to be less (or more) of an issue in the future? 10. In an email to Bess, Dao asks: “What can we truly know?” What does she mean by that? What message is Dao ultimately trying to convey? What has Bess learned throughout her journey that might help her answer this question? 11. Would you, in the end, marry someone who has been married eight times before? 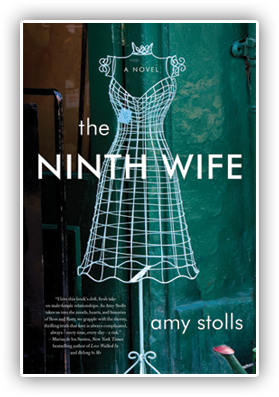 Is your answer different now that you’ve read The Ninth Wife? What would be some of the determining factors in your decision? What if he/she was married three times? Four times? How much “baggage” is too much baggage to bring to a relationship for it to work? 12. Have Bess and Rory learned what it takes to make a marriage last into old age? Do you think their marriage has a good chance of succeeding?